"City of robots" - is a media company, an organiser of large scientific interactive exhibitions "City of Robots" and "Open Space" in the major cities of Europe. A big interactive scientific exhibition of robots and modern technologies. Over 72 zones with each of which visitors interact, play, talk, try and control. 70,000 people visit the exhibition each month. The exhibition consists of several zones: zone of cosmonauts, zone of stars and far-out planets, zone of space missions. The majority of the presented exhibits are made specially for our exhibitions and have no analogues. An interactive exhibition which presents the latest models of robots from exhibitions in Las Vegas, Beijing and Berlin and 6 technoshow every 30 minutes. Many festival's technologies are exhibited for the first time in Russia. Before the start of "City of Robots" project the professional communities' exhibitions were the only place where the citizens of the most regions could get acquainted with the latest technologies. City of Robots brings technologies at hand and accessible to anyone. The first exhibition in the EU started in Tallinn on December 20, 2018. We believe sincerely that we help planting love of children and teenagers for future technologies, engineering and shape the wish to create and invent. The exhibitions are held in different cities within a limited timeframe: 25 to 48 days, and they always become a season's highlight event. 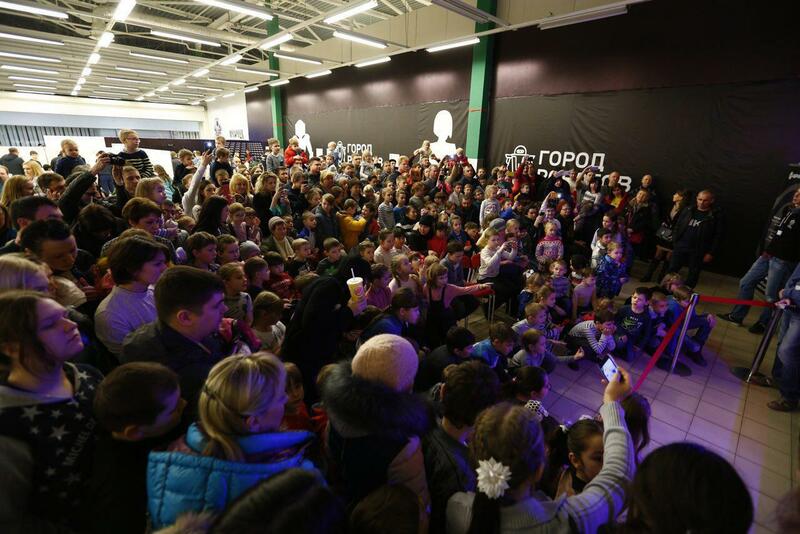 In the photo: performance of City of Robots' theatre of robots in Saint-Petersburg, in shopping complex "Piterland". 72 robots, 8 virtual reality zones, a helicopter controlled by thought, drawing in space and other technologies of the future are presented at the exhibition. The latest generation robot Promobot V4 capable of expressing emotions on its "face", moving hands and dancing just like a human. The robot can speak, answer questions and understands when it shall recharge and it stands on the charging station. Unique mixed reality glasses. As distinct from the majority of other virtual reality devices of augmented or mixed reality, HoloLens is autonomous and does not require connection to PC, smartphone or a game console. A blue-eyed beauty whose face and manners are close to those of a human. It can move around the room, move its arms, head and body. Kiki is capable of recognising a human, talk to her and answer questions. A big interactive scientific exhibition. Space zones are not just beautiful decor, each of them "plays" with a visitor, telling about some interesting facts of the mysterious universe and the life of cosmonauts. The device will help you to hear your voice as it would be heard under the effect of atmospheres of different planets! A huge light pipe records and transmits your voice to the distance of hundreds of millions of kilometres to space and returns it to headphones as its Martian sound version. Once you get to the site you become a real star which is to evolve from a protostar to a white dwarf. Interact with other stars and experience a big stellar explosion. A feast of technologies: robots circus, drone show, orchestra with robotic musicians, red carpet for robotic celebrities and much more astonishing which can be seen only at the Festival of Robots. The world's first robotic fish Miro from Korea. It has artificial intelligence and copies the movements of a living fish precisely. A unique device for visualisation of a 3D image. The objects literally levitate in air, they move just like in sci-fi films. The small robot fits on one's palm, but it has got artificial intelligence, it can tune to one's mood and will be a good friend. Federal universities take part in our exhibitions, we are always supported by the Ministry of Eduction and local authorities. До появления роботов организаторы создавали самые популярные средства массовой информации в Казани и Самаре. Мы можем сделать рекламу, которая работает. Каждые 15 минут наша акция воспроизводится в городе, каждый гражданин старше 25 лет видит нашу рекламу в Интернете. Выставка привлекла 2 230 000 человек в 38 городах страны. Наш опыт позволяет проводить выставки на очень качественном уровне. We have designed a route for visitors over the exhibition meticulously, the design and wall structure were developed by a team of architects. The project has already been accommodated in trade centre "Mega" (Kazan), retail and entertainment centre "Aquarelle" (Volgograd), retail and entertainment centre "Park House" (Togliatti), OZ Mall (Krasnodar). In different cities our partners were the world brands: McDonald's, Okey, Lukoil, Auchan, Sportmaster, Detskiy Mir, Leonardo. The guests may leave and enter the exhibition all through the day, that's why the traffic is enjoyed by the food court and leasers. The guests spend at the exhibition on average 4 hours 21 minutes, very many of them stay for the whole day. So that the visitors would not be disappointed with discharged or broken down equipment, we have a stock of 2 or 3 copies of each robot. A team of 9 organisers elaborate each step, text or picture. They adore their job. You can request references from the director of any trade centre we cooperated with. We are ready to provide you with our contact details and we are sure of positive feedback. Each exhibition event is supported by regional ministries of education and culture, administrations of cities and regions. What space are we looking for in a trade centre?